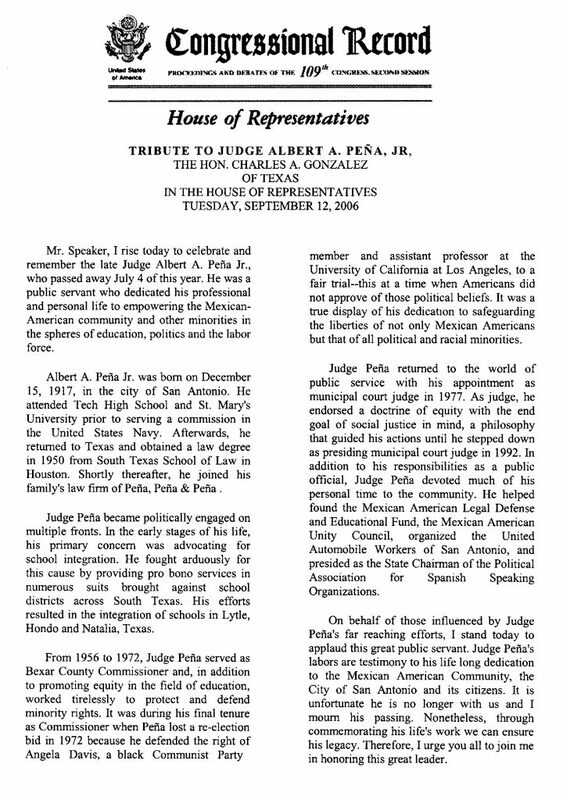 THE GREAT JUDGE ALBERT ALMENDARIZ PEÑA, JR. In 1951, immediately after passing the Texas State bar, Albert A. Peña, Jr. investigated complaints of segregation in Hondo, Texas at the request of Dr. Hector P. Garcia. 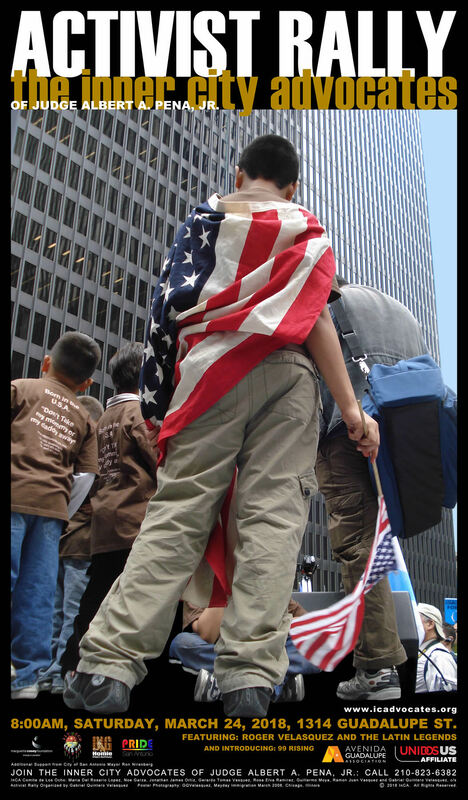 Peña’s pro bono services in numerous suits brought against school districts across South Texas led to the integration of schools in Hondo, Lytle, and Natalia. In 1952, he co-founded the Loyal American Democrats in order to rescue the Mexican-American vote from “barrio politicos”. In 1956, Peña was elected to Bexar County Commissioners Court representing District 1, a seat he held for sixteen years. In 1958, Peña was instrumental in the Bexar County victory of Henry B. Gonzalez over Maury Maverick in the Democratic Primary for Governor against Price Daniels and again later in Gonzalez’ 1961 victory for the vacated Kilday District 20 Senate seat. In 1959, Peña and a group of political activists established the Bexar County Coalition (Peña, GJ Sutton, Jimmy Knight and Jack Martin) that brought together various sectors of San Antonio that had previously been excluded from city politics. Considered the “four legs”, this coalition successfully fielded candidates for the Texas Legislature over the next 10 years. In 1959, Lyndon B. Johnson considered Peña’s Texas endorsement for President crucial to his campaign forcing LBJ to concede two conditions for Peña’s support: 1st—a Mexican American must be selected as a voting delegate to the Democratic National Convention; 2nd—that the conservative Texas delegation support the civil-rights plank. Peña attended the 1960 Democratic National Convention in Los Angeles as the lone Mexican-American delegate from the state of Texas. Later in 1960, Peña was offered the chairmanship of the Texas “Viva Kennedy Clubs” by Kennedy campaign staffer Carlos McCormick, which led to John F. Kennedy’s slim victory in Texas. Peña, not originally a Kennedy supporter, accepted the role under 3 conditions: 1st—that the Kennedy supporters would be seen as a freestanding political group and that this group would bypass all state organizations working directly with the Kennedy staff; 2nd—that Mexican-Americans receive “significant” appointments in the new administration; 3rd that the new president eliminate the poll tax. Robert Kennedy, who headed JFK’s presidential campaign, personally accepted Pena’s conditions. The Viva Kennedy Clubs resulted directly in the formation Texas MAPA in 1961, which quickly transformed into the “Political Association for Spanish Speaking Organizations (Peña presiding as Texas State Chairman). PASO was the basis from which political support was given to the Chicano Crystal City takeover, considered the 1st Chicano uprising. In 1967, Peña was a participant in the Raza Unida Conference, considered the beginning of the Chicano Movement in Texas. In 1969, he helped to organize the march on Del Rio, Texas to protest discriminatory practices in that county. He was arrested 1970 when police attempted to break up the picket and boycott of the San Antonio Savings Association, a response to racial statements made on National Television by San Antonio’s Mayor Walter W. McAllister. 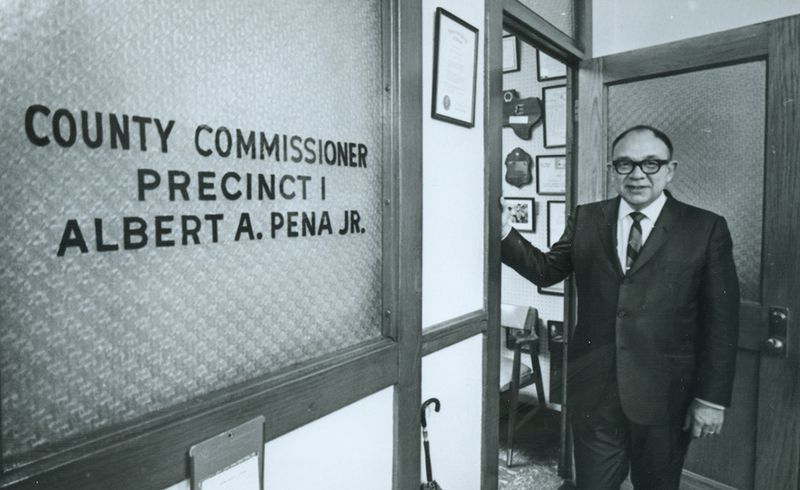 In 1978, Albert A. Peña, Jr. was appointed Municipal Judge, eventually becoming Presiding Judge. Peña retired in 1990 having served twelve years. He was instrumental in the formation of several national, regional, and local organizations dedicated to the purpose of promoting Chicano Civil Rights. Among these groups are The Mexican American Unity Council, Inc., The Mexican American Legal Defense and Educational Fund, Southwest Voters Registration and Education Project, and the National Council of La Raza, known in 1968 as the Southwest Council of La Raza. Peña’s final organizing effort was the “Inner City Advocates” through which he fostered a new generation of activists dedicated to inner city politics appointing Gabriel Quintero Velasquez as InCA’s first Director in 1999. © 2018 Inner City Advocates. All rights reserved.